Time sure flies when you’re not having fun, eh? I look up from the weary toil and realize that the Blogging from A-Z April Challenge 2011 begins on Friday. Yipes! I went to Arlee Bird’s site and discovered he has a game plan. I thought about this a couple of weeks ago but only in passing. Today I had a great idea for the challenge. You might remember several posts back I said I wanted to post more pictures? A friend of mine from high school inspired me (thanks, David! He’s an actor!) by doing something very cool. He has been posting what he calls 365 Days of Pictures, a different picture each day that he took that day. I think I will do this. This year’s theme will be Observation, and each picture will get a post regarding what drew me to take it, and what observations I have about it. Each photo will be of something that begins with that day’s letter. I feel strongly that this will sharpen that particular skill, which serves a writer well. I’ll probably do what I did last year and make Saturday’s posts very random. So be sure to check them out; they could be about anything! A bit of a cheat, I know, but I might have to take some pictures ahead of time, thanks to my stupid work schedule. Never fear, I’ll make sure they’re relevant. And yes, I do believe a large purse will allow me to carry my camera with me more often. Another thing I promise is to try and not make my entries so long. I get carried away sometimes, I know. But writing for wiseGEEK has helped me learn to make every word count. Also, time spent editing with William Brohaugh’s Write Tight book made me see how many extra words I use that aren’t needed. Peek into it here. Writing is learning and no one ever stops doing that. This year I’ve added a couple of things to the page. I welcome comments on my posts, and I invite you to step over to the Terms and Conditions; Comment Policy Page (see link at top and left of this page) before leaving one. Also, there is an email subscribe thing at the bottom right, so you can sign up to receive an email whenever I post a new post, should your heart desire. 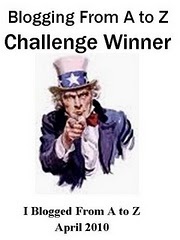 Check out the blog challenge and find some new blogs to follow. Last year there were some really neat ones, and this year there are over 700 entries. Thanks for visiting and I hope to see you back when the Challenge begins! Thank you, Liz, for gracing the world with your beauty. Not your lovely violet eyes, not your gorgeous hair and figure, but your inner loveliness, that shone like a beacon in everything you did. 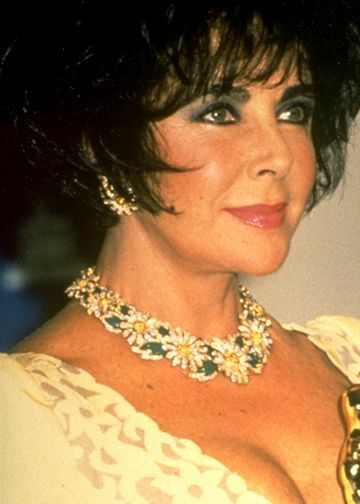 You were a golden presence on the screen, an icon loved by both men and women, a tireless champion for AIDS awareness and research, and a woman we were all proud to know, even if we didn’t really know you. I’m sorry I never did. A week ago, our Japanese friends suffered a massive catastrophe in the form of a 9.0 earthquake and subsequent tsunami. The disaster killed many people and completely destroyed several towns. It also caused a nuclear emergency at several power plants near the area, which is still ongoing at this time. Their careful preparation could not withstand the onslaught. People who survived the initial disaster are displaced. Humanitarian organizations, the US Navy and Japan’s own forces have been helping as much as they can. The heart of the entire world goes out to the Japanese people and everyone wants to help in some way. This page contains links to organizations helping in Japan. Before you give to any charity you might wish to check it out. Legitimate organizations will make their financials available so you can see where your money is going. The links on the page will take you to their websites where you can make a donation. Recovery from this disaster will take a long time. We have earthquakes in America; we’ve had disasters that were just as bad. Let’s keep Japan in our thoughts and prayers. Large earthquakes are no fun, I’m sure. And tsunamis freak me out. Here is a sound recording of the quake taken by the Japan Agency for Marine-Earth Science and Technology (JAMSTEC). There is also a video of the tsunami that shows why they’re so damn scary! I’ve been very busy getting my feet under me with the wiseGEEK articles and squeezing out another book. It’s not coming as easily as the last one. The hardest part for me is the first draft. Once that’s done, the revisions can begin. That’s where a book will really coalesce, where honing and shaping and squeezing and molding gets your brain dirty. Scheduling is the biggest mess, what with working all the time. Bleah. I’ve been working on some ideas for this and perhaps another blog, but all is still percolating. One thing I’d like to try is a continuing story, and I’m taking suggestions. So if you have anything you’d like to challenge me with, drop me a comment and I’ll take it under consideration. As usual, I’ll try to keep the focus on writing and art of all kinds. I’ve gotten away from reading my blogroll and even my emails lately. Just so tired this time of year…. According to the Farmer’s Almanac, later this month we’re to have “significant snow.” I dearly hope that the all-powerful and all-seeing Almanac is wrong, if not about the snow then at least about its geographical location. I need to be warm. WARM, I TELL YOU!